London is developing a Residual Waste Disposal Strategy that will create a long-term plan to manage residual waste. In the City of London more than one tonne of waste is produced per person each year. This includes waste generated at home as well as business waste. Much of this waste is diverted through numerous reduction, reuse, recycling and composting programs. The waste that remains is considered residual waste. All the residual waste generated at home and a portion generated by businesses is disposed of at the City’s W12A Landfill along with some waste generated from outside the City. The City’s landfill is expected to reach capacity in 2025. Some of the City’s business waste is taken to landfills located outside of the City for disposal. To plan for the future the City has started development of a long term Residual Waste Disposal Strategy. The Strategy involves the development of a long-term plan to manage residual waste and involves completion of an Individual Environmental Assessment (EA) as prescribed by the Ministry of Environment, Conservation and Parks (MECP). 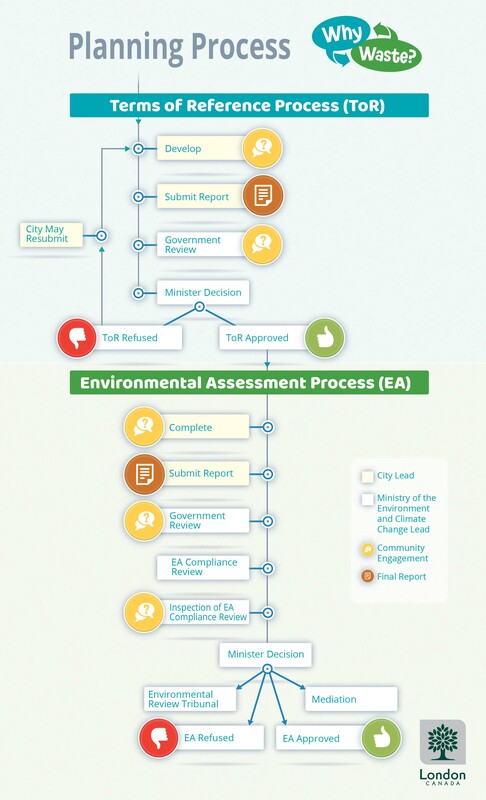 The individual EA requires approval by the Minister of Environment, Conservation and Parks. Our commitment to you is to do our best to provide information in easy-to-understand words. We will try to minimize the use of technical words, however some will be necessary to address the requirements of the provincial government and other approval agencies to ensure legislation, regulation and policies are being met. commit to increasing the current London residential (household) waste diversion rate to 60% by 2022 from the current rate of 45%. A companion Resource Recovery Strategy is being developed in conjunction with the Residual Waste Disposal Strategy. The Resource Recovery Strategy will involve the development of a plan to maximize waste reduction, reuse, recycling, and resource recovery (e.g. composting, biogas and other waste conversion) in an economically viable and environmentally responsible manner. After more than one year of community engagement the Proposed Terms of Reference has been completed and submitted to the Minister of Environment, Conservation and Parks. See what others are saying and let us know what you think. Sign up to receive project updates and opportunities to provide input. City of London Residual Waste Disposal Strategy. Environmental Assessment of the Proposed Landfill Expansion. 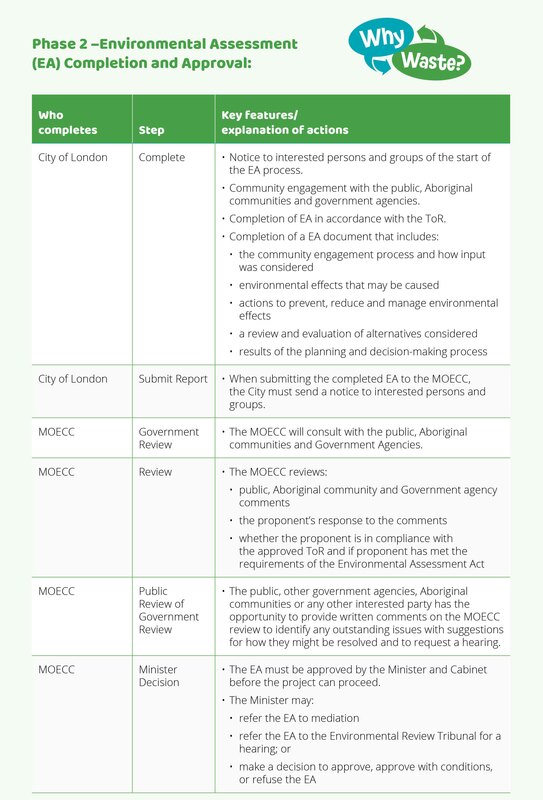 Environmental Assessment for Proposed W12A Landfill Site Expansion. Map shows the locations that can use the W12A Landfill under its existing license. Open Houses were held on May 24 and 25, 2017and November 29 and 30, 2017 to inform residents about the City's plan to develop long term Residual Waste Disposal and Resource Recovery Strategies and receive feedback. Some of the materials presented at the Open Houses are provided below. 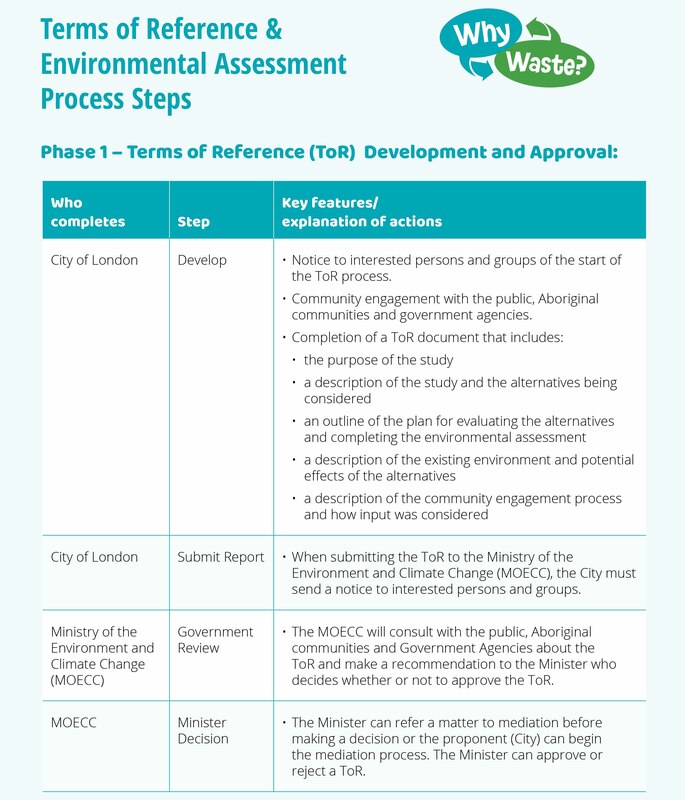 The first phase in the Environmental Assessment (EA) process is preparation of a Terms of Reference (ToR). The ToR becomes the framework or work plan for carrying out the EA. The steps in preparing a ToR are presented in “The Process” tab and summarized below. The Proposed ToR was developed with extensive stakeholder engagement which included open houses, a project website, establishment of a Waste Management Community Liaison Committee, attendance at community events and newspaper and social media advertisements. The Proposed ToR was approved by City Council on October 2, 2018 and formally submitted to the Ministry of the Environment, Conservation and Parks (MECP) on October 12, 2018. MECP reviews document and seeks comments from stakeholders. The 30 day comment period for stakeholders ran from October 12, 2018 to November 12, 2018. The City has the option to amend the Proposed ToR to address comments received during the government review. This took place from December 14, 2018 to February 8, 2019. The Proposed Amended ToR was submitted to the MECP on February 8, 2019. The City also submitted a black-lined copy which shows all the changes that were made to the original Proposed ToR. It is expected a Ministry Decision on whether to approve or refuse the Proposed Amended ToR will be made on or before May 3, 2019 (12 weeks after submission of the Proposed Amended ToR). Expansion of the W12A Landfill is the most appropriate disposal option based on previous waste studies. Add an additional 25 years of capacity to the W12A Landfill. Commitment to increase residential waste diversion from 45% to 60% by 2022. Decrease the maximum amount of waste that can be received in a year from 650,000 tonnes to 500,000 tonnes. Create a regional service area for the landfill.